But first, I've got a new arrival! I received the loveliest package the other day from my friend Kate @ Smiles from Kate--an adorable mini quilt and a boatload of surprises! You might remember that Kate and I decided last year to have a mini quilt exchange. We became friends through last year's New Quilters Blog Hop. This year's version continues this week, but more about that in a minute. First let's take a look at what Kate sent me all the way from England! First, she included her mini quilt in my favorite colors lime and purple! She also included a wonderful charm pack of Oakshot cottons which are so unbelieveably beautiful. If you've never seen shot cottons, they shimmer with different colors depending on the angle at which the light hits them. These are especially gorgeous. I'm going to make something wonderful with them! Kate also included a selection of Twinings tea. Although we can get Twinings here in the states, we can't get all the different varieties she included. Also, my husband has been to London and had Twinings Earl Grey while there and he says it tastes better than our version. So when I opened the package Kate sent, his first comment was "Lovely quilt. Oh my! It's the real Earl Grey!" I can't wait to try it and see if the difference is simply his imagination. I doubt it because man, that tea smells so wonderful! Finally, Kate included a bit of Liberty fabric. I had told her that I loved Liberty and would kill to get some. So she wrangled some from a friend because she doesn't live anywhere near London and was unlikely to get some on her own. It's it wonderful? Kate signed her piece on the back. I love that label! Kate quilted the mini with diagonal lines through those incredibly tiny HSTs. Don't you love the way she finished the binding? This quilt is going up in my studio where I can look at it every day and think about how lucky I was to meet Kate through the New Quilt Bloggers blog hop. Speaking of which, the hop continues this week with more quilt bloggers and more giveaways! Please visit these lovely ladies from my hive, the Blooming Quilters. Be sure to also visit Yvonne @ Quilting Jetgirl and enter this week's giveaway! The prizes are awesome. Thanks also to the other blog hop hosts, Beth @ Cooking Up Quilts and Leanne @ she can quilt. I so appreciate you supporting us new quilt bloggers! 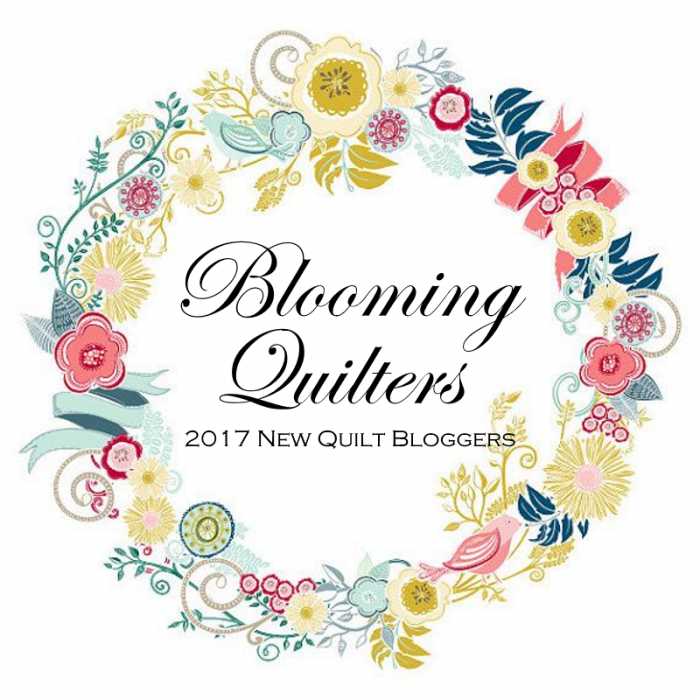 It’s the Last Week of the New Quilt Bloggers Blog Hop! Tell me...have you ever participated in a mini swap? Older PostChanges to My Blog and More!